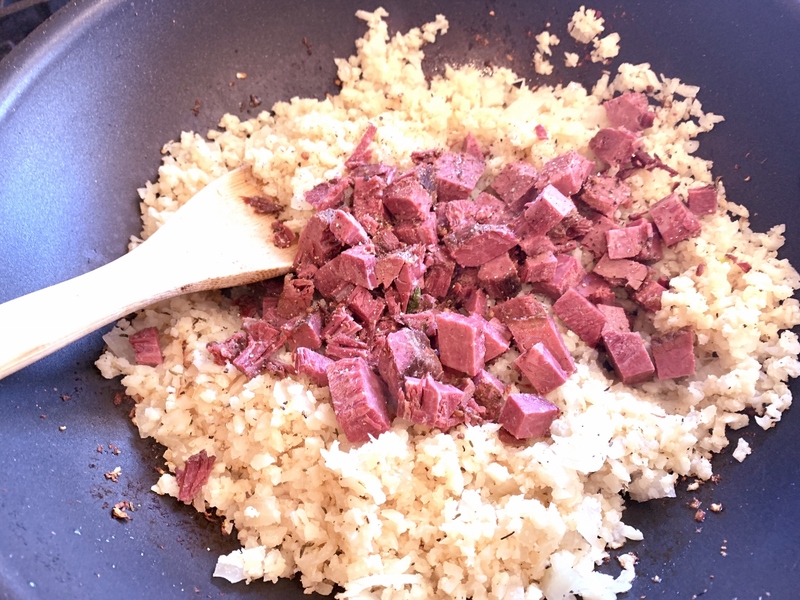 Corned Beef & Riced Cauliflower Hash - Recipe! - Live. Love. Laugh. Food. 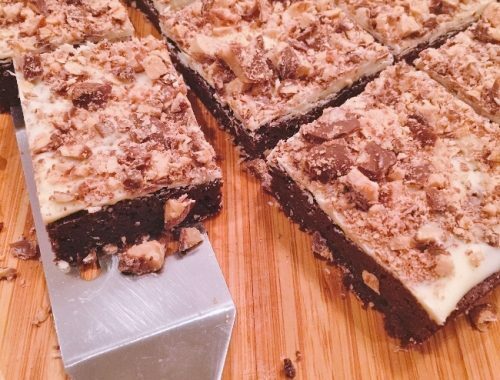 St. Patrick’s Day is a day full of Irish splendor and fun, sometimes beginning with a Guinness or a shot of Irish whiskey, but for many of us it starts in our kitchen. Creating Corned Beef & Cabbage is part of the day’s plan as well as selecting the appropriate green colored attire to wear, so you don’t get pinched. Some ignore the whole day altogether, but even if your not Irish blooded, cooking up some Irish grub makes for a pretty fun day. After the corned beef is sliced and the cabbage is stewed and eaten, there is always a bit of beef leftover for the next day or two. Corned Beef and Hash makes the most perfect breakfast or brunch, or these Corned Beef Sliders that I just adore can be easily stacked with next-day sliced corned beef and slaw. 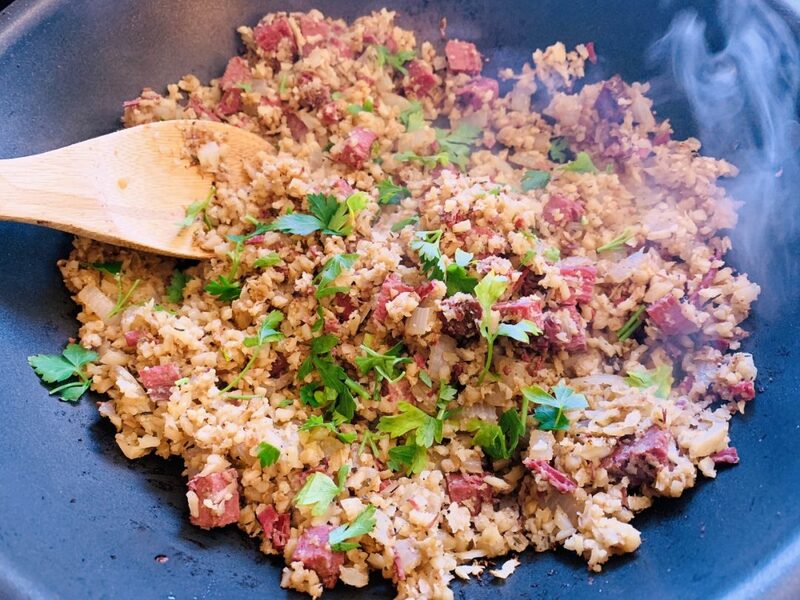 This year, I wanted to go a little healthier since today will be such a splurge, so I used riced cauliflower instead of potatoes in my hash recipe to create a steamy low-carb meal that’s great to eat anytime of the day. Riced cauliflower can be pulverized beautifully in a food processor, or you can buy it already prepared at the grocery store. 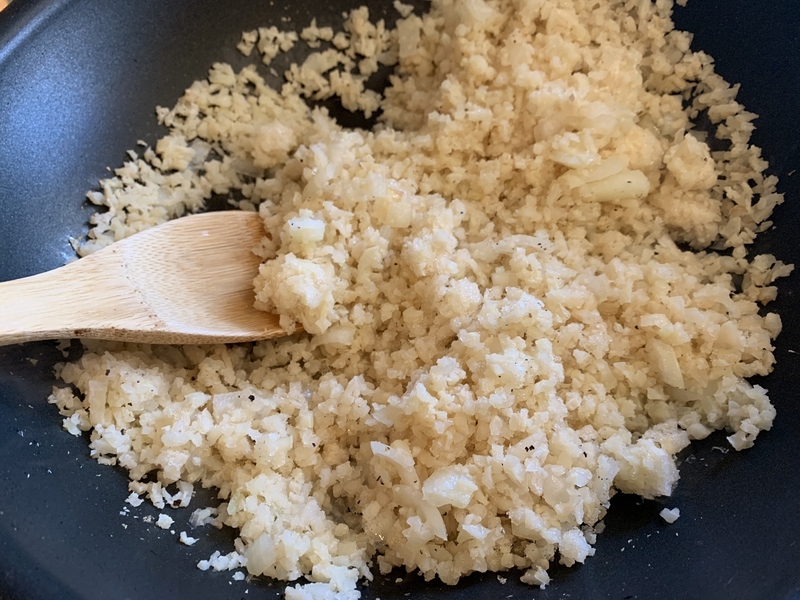 Allowing the cauliflower and onion to cook until almost crispy is the key to a good hash and adding the appropriate dried spices doesn’t hurt either. 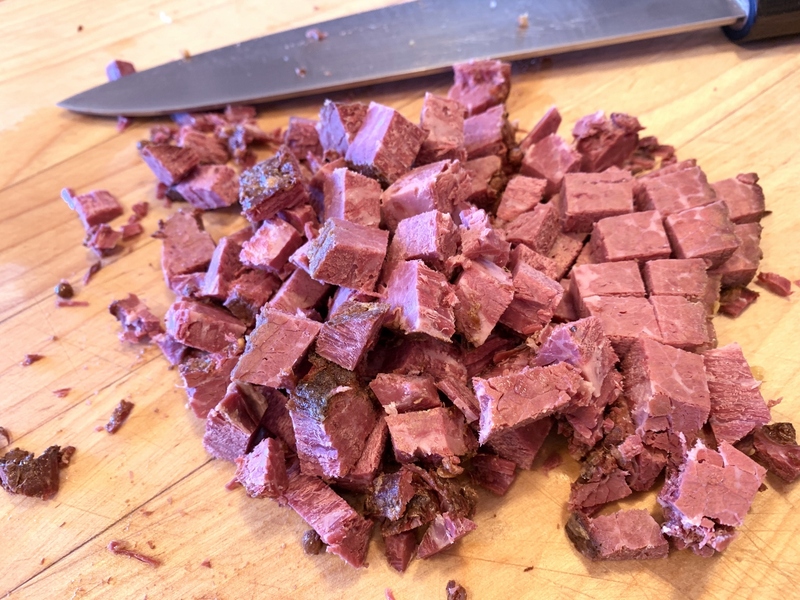 Chunks of corned beef add a nice hardy touch to this dish and a splash of Worcestershire completes it. I served my cauliflower hash hot, straight from the skillet, but you could always fry up a few eggs to place on top of each bowl. 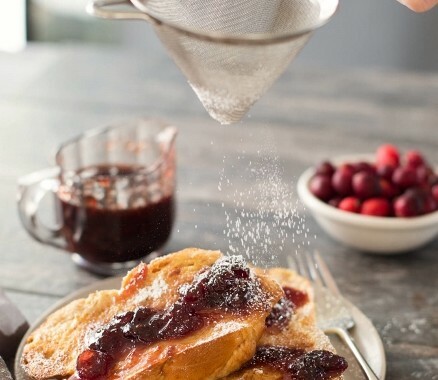 This sounds like a morning meal, but who doesn’t enjoy a little breakfast for dinner now and again? Happy St. Patrick’s Day! In a large non-stick skillet or wok, add 1 tablespoon oil and place over medium-high heat. Add onion and riced cauliflower, stir. Saute for 6-8 minutes, or until edges of cauliflower just begin to brown. Add onion power, garlic powder, thyme and 2 teaspoons salt, stir. Continue to cook for 1 minute. Add diced corned beef and 1/2 teaspoon black pepper, stir to combine. Cook for 3 minutes while stirring occasionally. Add Worcestershire sauce over top and stir to incorporate throughout. Cook for 2 minutes and turn off heat. Sprinkle with fresh parsley and serve immediately. Enjoy! 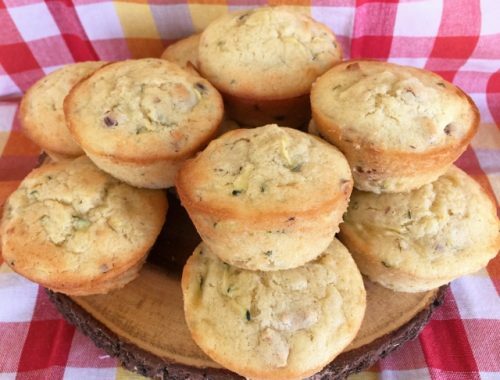 Zucchini Pineapple & Hazelnut Muffins – Recipe!